Do You Think Putting a Sticky Tape Over Your Webcam is Enough? Well, IT IS NOT! ShieldApps’ Webcam Blocker is a cyber-privacy software designed to protect your computer’s webcam and microphone from hacking attempts and any internal or external breach. Upon selecting the options any external or internal attempt to access the webcam will be denied. The Microphone Blocker feature blocks access to the computer's audio port, providing the user complete and absolute confidence and privacy. 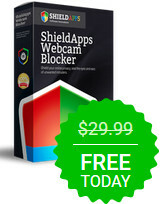 ShieldApps Webcam Blocker adds another layer of protection to your computer and proactive privacy approach! 72 hours or less time left & this time may be extend,reduce or SOS has own rights to cancel this giveaway before the expiration date! !